Beirut: A 10-day air offensive by Syria’s regime against rebel areas of divided Aleppo city and nearby villages has killed more than 400 people, including 117 children, an anti-regime monitor said Wednesday. The Syrian Observatory for Human Rights said that by Tuesday night the toll since December 15 from air strikes and a bombing campaign using barrels packed with TNT stood at 410. 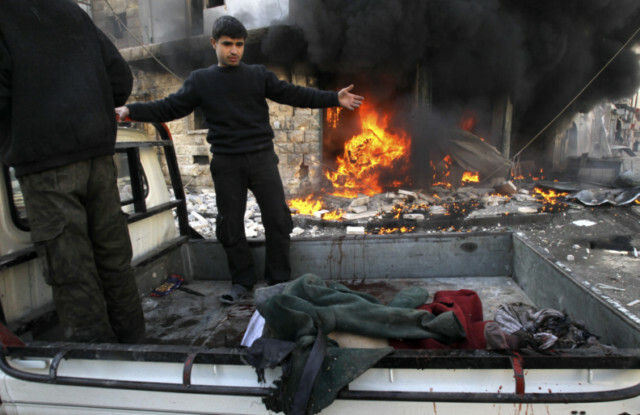 Also among the dead were 34 women, 30 rebel fighters and nine jihadists. The Britain-based group said that the air force pressed its assault into an 11th day on Wednesday, with fresh raids on the opposition-held district of Sakhur in eastern Aleppo city. However it had no immediate information on fresh casualties. Aleppo has been divided into regime and rebel-held enclaves since the opposition launched a massive offensive in July last year. Rights groups have blasted the regime’s relentless air raids against Aleppo and its dropping of massively destructive barrel bombs in civilian areas. Human Rights Watch has described the use of such weapons as “indiscriminate and therefore unlawful”. The United States too has condemned the regime’s aerial assault on civilian areas of Aleppo, accusing the military of using barrel bombs and SCUD missiles “indiscriminately”. The opposition National Coalition has said it will boycott peace talks slated for January if the bombing of Aleppo does not cease. A security source in Damascus on Tuesday defended the military’s operations to “save Aleppo”. “We do not target any area unless we are 100 per cent sure that the ones there are terrorists,” the source said, using the regime’s term for the rebels. Syria hit back at the US on Tuesday, describing it as a “one-eyed pirate” for condemning the aerial assault but “ignoring the crimes committed by the terrorists”. Meanwhile, fighting raged on Wednesday in the Aleppo province area of Naqarin, pitting rebels and jihadists on one side against the army backed by Lebanese Shiite Hezbollah fighters and the paramilitary National Defence Force. The regime’s ground forces were backed by helicopters. which dropped barrel bombs on rebel-held areas, the Observatory said.